Prior to the launch of this innovative initiative, the entire process of awarding contract to transporters, labour and door step delivery was through eTendering process. The tendering process for transport contracts for lifting stock from FCI to godown is been carried out by head office wherein tenders for door step delivery contracts are carried out by DSM Office (District office) in every taluka. The project is designed based on the fundamental principle of good governance, transparency, reliability and convenience from the view point of end users and stakeholders. GSCSCL has implemented reverse eAuction to execute online e-auctions efficiently, secured, transparent and automated environment using best standard industry practice without compromising their existing processes. GSCSCL aimed to award logistics and labour contract using reverse e-Auction method. To do the re-engineering of process (if any) and bring uniformity and automation at various levels, i.e., submission of documents, scrutiny and approvals . To expedite the end to end auction process of auction from creating auction, publishing, monitoring till announcement of winner. To enable Bidders to register and participate in auction from anywhere. 24×7 online service availability to all the stakeholders by providing a secure, reliable, efficient, sustainable and integrated web based solution. Ease in information accessibility to all the stakeholders like Bidders, Department, etc. Effective monitoring and transparency in auctions. Better prices with real time dissemination of information. Use a centralised database and data definitions. Increased buyer and seller reach. Real time analytics for better decision making. Pioneers in using reverse eAuction method – the first initiative in the country by any civil supplies corporation to have its own e-auction platform for awarding contracts to transporter and labour and same can be replicated in other states of the country. Direct Cost Reductions: GSCSC Ltd saved Rs 28.69 crores by doing reverse e-auction for transport, door step delivery and labor contract. GSCSCL is engaged in procurement, storage and distribution of essential commodities like wheat, rice, maize, sugar, edible oil (refined cottonseed oil), refined iodised salt and pulses, tur dal, moong dal(mogar), chana dal and chana for NFSA – 2013, Public Distribution System, Midday Meal Scheme, Integrated Child Development Scheme (ICDS), etc . GSCSCL also procures various commodities such as wheat, paddy, maize, bajari, etc , from farmers under minimum support price (MSP) scheme of Government of India. Sampling and testing of agri-commodities procured for Midday Meal Scheme and Integrated Child Development was done by NABL accredited laboratories under the supervision of experts as per the quality specifications notified by the subject expert. Despite having a panel of NABL accredited, the QC results were found to be incorrect in various instances with the average annual out go of Rs 60-65 lakhs with unsatisfactory results. From October 2017, quality analysis started at Forensic Science Laboratory of Directorate of Forensic Science, resulting improved quality appreciated by the office of Midday Meal Scheme / Education department. Considering positive response/ appreciation in quality by end users and the beneficiary department, GSCSCL took initiative to sign an MoU on December 7, 2017 with Directorate of Forensic Science for 10 years to set up a state-of-the-art facility –“ Food Research Laboratory” (FRL)—for testing by GSCSC which started working from December 19, 2017. 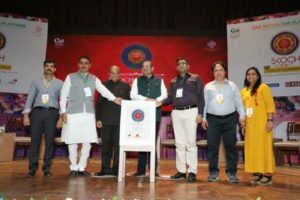 FRL has set the benchmark standard for agri-commodity testing in Gujarat and It is India’s first initiative of forensic based food quality check. Food Research Laboratory set up by FSL for GSCSCL was launched by Gujarat Chief Minister VijayRupani on January 4, 2018. This is a combined initiative of Food & Civil Supplies; Education, Woman & Child and Home Department. CSI Nihilent e-Governance Awards 2018 for eRAMS – Electronic Reverse Auction Management System GSCSC also received e India Digital Transformation Award for E-Ram (Electronic Reverse e-auction System).